Mike has been living in his house for about 2 months and is still working-out the best place to store his stuff. There’s storage in the loft above the bathroom, under the living room seating, and his clothes are in a small shelving area he built into the loft with the queen sized bed. He found an amazing location to live. He caretakes a 53 acre property for an elderly man that had to move in with his daughter. There’s a house and a barn on the land and Mike plugs his tiny house into the barn for electricity. He lives on the land rent-free in trade for care-taking services. He has a rain collection system on the roof of his tiny house and uses a composting toilet. The greywater from the sink and shower is filtered and waters the woods, away from the house. In the kitchen he has a propane oven/cooktop, a propane on-demand hot water heater, and a thermostat controlled propane cast iron fireplace. So the only recurring cost for the house at this point is his propane! Mike lives there virtually free! He did all the work on the house himself, which took almost 9 months to complete. The winter months slowed him down, so it took longer than he expected. He made all the cabinets and the countertop from 1×10 cherry boards glued together. The flooring is 1/4″ hardwood that he installed in a herringbone design down the middle of the floor. Mike… thanks for sharing your house with us. 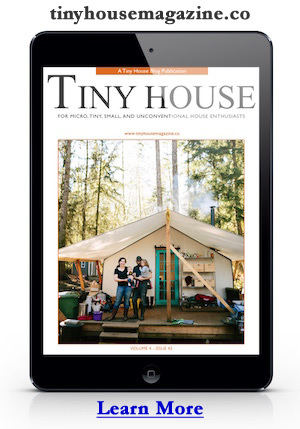 What you’ve created is a great example of what the tiny house movement is all about. I know it must have been a challenge to make everything come together the way you did, but now that its done, you can enjoy the rewards. Thanks again! This entry was posted in Uncategorized and tagged caretaker, composting toilet, mike, propane, stove, tiny house. I really love this Tiny House! I would like to see the floor plan and learn more about how this was built. The house was built without an official set of plans. I liked the ideas of different designs and came up with what you see. I like the loft over the living room as apposed to the kitchen are. I also like the shed style roof because it gives you more room when you are in the loft. I put a door on the loft above the bathroom to hide the storage of seasonal stuff and things I don’t use that often. I don’t know where to begin praising this tiny house. It is amazing! Beautiful, functional, and very inviting and warm. Great job! I am glad you were able to find the living arrangement that you did. I know it hielps those people out as well as you. Again, great tiny house! Free as in living in a coffin, after the initial purchase cost it FREE living. …as in monthly expenses. Cost of propane seems like a small price to pay. I’ll overlook the coffin comment. I am impressed, in fact very impressed. Obviously a lot of thought went into this home, it is very functional and your woodworking skills and attention to detail are of a higher standard than I have observed in some very high dollar ‘luxury’ homes. Can you tell me about your propane heater? What did you do on the highly textured wall behind the seating area. It looks interesting! Are you in an area where you can count on year round rain? Thanks for the comments! The propane heater is a Regency H15 cast iron heater. I have it hooked up to a programmable thermostat and bought the blower that attaches underneath to help distribute the warm air. The stove is rated at 18,000 BTU’s which is much bigger in size compared to the typical marine stoves you see in different houses. The back wall in the house is left over cedar siding. I cut the pieces into different thicknesses and widths to give it the textured look you see. I used liquidnail and finishing nails to hold them all in place. I live in Kentucky so the weather is a little warmer here. I built an enclosure on the side of the water storage tank to enclose the hose and spout. I hung a work light inside the enclosure to help keep the hose from freezing. I’m not too concerned about the tank freezing. The tank may get a little ice on top but it doesn’t stay cold long enough here to cause too many issues. I hoping for rain throughout the winter. If that doesn’t happen I can run a hose from the house that is one the property as a back-up. Wow! Really really nice. So much detail in the wood work, I love the vines etched into the wall. It’s warm and inviting and I love the kitchen and the “real” stove. Hi Mike ! your bathroom toilet is the classiest one I’ve seen. Do you have more photos ? I am building a cowgirl camp and want have a nice compost bucket toilet in the outhouse. This looks beautiful !